Charm school produces a 70% Belize bar that is beautiful, refined, and really, really good. It doesn't pull a lot of punches flavor-wise (well, maybe one big surprise right in the middle! ), but is a really great, consistent bar with a good bit of playfulness. On the nose, I wasn't terribly impressed with the aromas coming from this bar; it just didn't really speak very loudly in the olfactory department, and I thought maybe this would hint at a bland, flat-tasting bar. But no. Whatever the chocolate lacks in aroma, it more than makes up for, the second it hits the tongue. 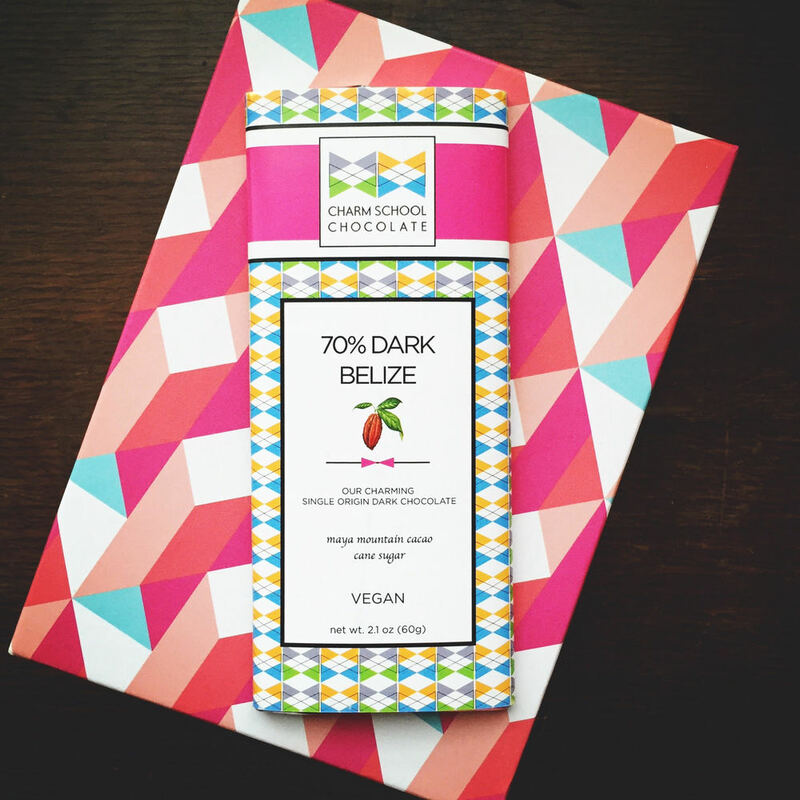 This is a bright, bursty kind of chocolate, heady with notes of raisins and dried cherries, but also of that tart, apricoty, beautiful Belizian acidity. Towards the middle, something I've tasted widely in Nicaraguan chocolate (but never before in Belizian) peeked out from under the cherries: that wonderful Oreo cookie flavor I love so much! I was so pleasantly surprised to find in the brief tasting notes on the package these wonderfully validating words: "reminiscent of plump raisins and chocolate sandwich cookies". Wonderful stuff. As all that fruity, cookie-tinged wonderfulness began to fade out, notes of cream and vanilla finished it all off, with a sharp little wink of astringency at the end to remember it all by. Just about the only detractor for this bar, aside from the less-than-robust initial aroma, was the mouthfeel; it was a little less smooth than I would have expected from a bar of this beauty and complexity, though this admittedly didn't detract from the flavor experience. Overall, this chocolate bar kept me coming back all week for more, and I was sad to see that last bite disappear; after learning more about the lineup of Charm School's delightful bars, I've happily concluded that more research is needed! Headed by Joshua Rosen, Charm School Chocolate--a bean-to-bar craft chocolate maker out of Reisterstown, Maryland--centers their philosophy on the adage "It's rude to exclude". That's why all of their bars are vegan and eco-friendly (even their white chocolate and milk chocolate bars, which use coconut milk instead of standard dairy. Charm School was founded in 2012 after Rosen, orginally a mechanical engineer student, began to veer towards his love of cooking; this eventually led him to enroll in the Culinary Institute of America, and then on to an internship in San Francisco, and work in New York and even Tuscany. After all that, he came back to Maryland to begin his own bean-to-bar chocolate making journey, and the result is oh-so-sweet.